Where to Buy Havoc Rodenticide Bait Pack, Havoc Rodenticide Bait Pack Pellets - 40 x 2 x 50 Gram - $61.55 for Sale with Fast Free Shipping! 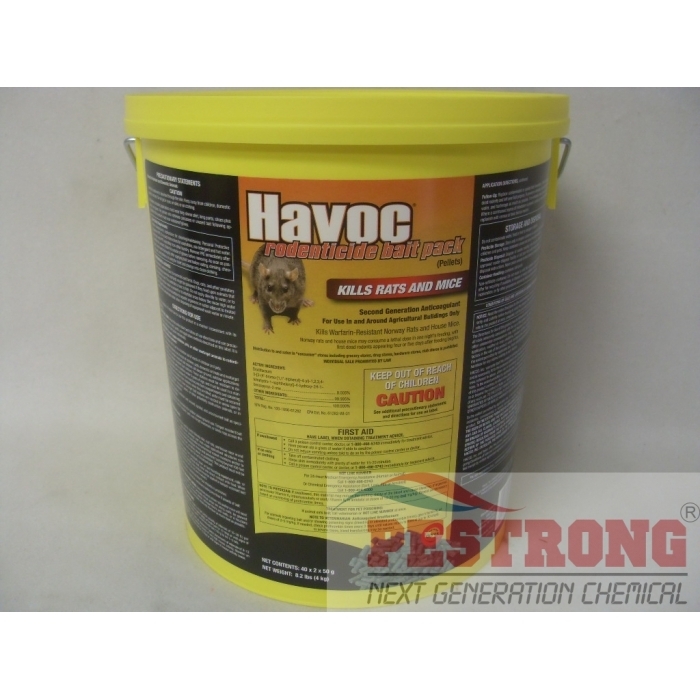 Havoc Rodenticide Bait Pack Pellets - 40 x 2 x 50 Gram is the strongest anti-coagulant rodenticide that combine brodifacoum with a special mixture of highly attractive bait ingredients along with patented food processing techniques. The result is a superior, single-feed rodenticide in a unique bait delivery system. Kills Warfarin-Resistant Norway Rats and House Mice. Norway Rats and house mice may consume a lethal dose in one night’s feeding, with the first dead rodents appearing four or five days after feeding begins. Very effective in killing mice. It's easy to place around the area since they're just little packets. It's small enough where I don't have to clean up any leftover mess and it's large enough to contain a killing amount of poison.